I love making homemade granola. Not only does it taste good, but it makes the house smell amazing. I usually stir up a new recipe every time I make granola. I can’t help myself. There are so many flavors to play around with. This time I went with a fall theme and made a batch of pumpkin granola. When the granola was finished baking, I stirred in dried cranberries and pepitas. I didn’t add nuts because Josh is allergic, but feel free to add in a handful or two. Almonds or pecans would be a delightful addition. I love the large crunchy clumps in this granola. If you aren’t a clumpy fan, just break them up. This pumpkin granola is good eaten plain, as a yogurt topping, or with a splash of cold milk. The perfect fall granola! Enjoy with yogurt, milk, or by the handful! Preheat the oven to 325° F. Line a large baking sheet with parchment paper and set aside. In a medium bowl, whisk together brown sugar, pumpkin puree, applesauce, maple syrup and vanilla extract. Whisk until smooth. Pour wet ingredients into oat mixture and stir until the oats are evenly coated. They will be moist. Evenly spread the mixture onto the prepared baking sheet. Bake for 20 minutes. Remove pan from the oven and stir. Bake for an additional 15-20 minutes or until the granola is golden and crisp. Remove from the oven and stir in dried cranberries and pepitas. Let cool completely. Store in an airtight container. My favorite granola! I LOVE that there is no added oil or butter but it still looks crunchy and perfect. I’ll have to throw a batch together this weekend, no candle needed 🙂 Thanks Maria! I am printing this off now and making it tonight!! Great recipe that doesn’t have any oil or butter. I also love that you added pepitas! I need no convincing. I am making this!! Mmmmm! I am loving this recipe maria, looks fabulous! ooooh this is such a fall sounding treat! i love it! Great recipe! I haven’t had breakfast so I’m drooling. I love that there is no butter, oil, or nuts! My 2 little boys are allergic also. I can’t wait to make this! What a great flavor for granola! YUM! i can’t wait to try this…it sounds so incredible! Ahhhh…nice bowl of goodness for a crisp fall morning!! Perfect timing for this recipe! I have leftover pumpkin puree and homemade applesauce in the fridge… and there are always oats in the pantry! I’m going to try to make this this weekend! I hope you like it Megan! Wow, does this look amazing! I’ve never made my own granola before and now I really want to try! Mm I LOVE pumpkin and the idea of this spooned into some Greek yogurt has me swooning! this looks great! all of the pre-made pumpkin granolas I have seen have coconut (wish I strongly dislike) so this is perfect! I love pumpkin and granola. Thanks for the wonderful, healthy, recipe combining the two! LOVE IT! What a healthy treat! I’ll share this post on my facebook page. I totally need to try this ASAP (maybe even tonight!!!) Thanks for sharing! What a great idea! My kids would be crazy about this granola. What a wonderful fall treat! As it gets cooler, my husband and I like to take more long walks and hikes, and this would be the perfect snack to take along. Thanks for the recipe and beautiful photos! Great idea for granola, this looks so healthy and tasty. I would love this granola over a bowl of warm oatmeal!! I think you read my mind. I was just wishing for a pumpkin granola recipe since I didn’t feel up to making one up on my own. Yours is pretty healthy too with less oil/butter. Perfect! Sounds wonderful! I have only made granola once, with mostly applesauce as the binder, so it was pretty healthy, and I was thinking about swapping that out with pumpkin for the next batch. Seeing what you’ve done, I guess that should work 🙂 thanks! homemade is MUCH better than store-bought and it does make the house smell festive! I love making my own granola! This version with pumpkin is too good to pass up…thanks for posting! Hope to see you in SF! wow this looks so good! I’ve never thought of using pumpkin puree in granola- what a fabulous idea! I made some plain old maple granola last weekend and my little girls gobbled it up in two days! I have to try this one out. Emily-I hope your little girls enjoy this granola as well! Love this!!! I love anything pumpkin. I have never even thought to make pumpkin granola! I definitely have to make this soon! Wow! This is perfect!! So good for you. I bet it smells great! So making this. I have granola on my oatmeal and this just screams make me. What a fabulous idea!! I am so making this too! Oh yumm! I haven’t made homemade granola, I am going to try this! My granola bin is empty. Perfect timing on the post! 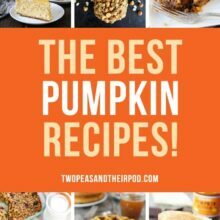 What a great idea – I never thought of using pumpkin puree for granola. This has so many possibilities – thank you for the inspiration. I can guarantee you I’ll be making this. I have my granola almost every single day! Anp pumpkin is perfect! Holy cow this looks and sounds wonderful! I think I’m going to have to give this recipe a try. Thanks for sharing! This is so funny because I just prepared a post about granola too! We must be on the same wavelength 😉 Can’t wait to see the kitchen!! This sounds great! 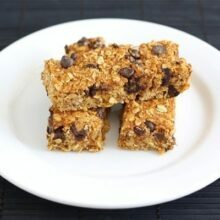 I’m going to make a batch of this and then make some granola bars with it. I’ll have to remember this recipe when I have just a bit of pumpkin leftover. It sounds perfect for fall. 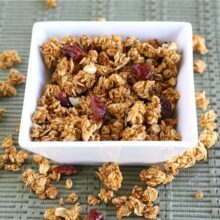 I have never made my own granola before, but it would be a perfect snack to take to work! Fantastic recipe, Maria! I will definitely be making this for my family. I love that there is no butter or oil used. tried this today – yum!! i used 3.5 cups oats and 2 cups rice krispies, and toasted the oats/cereal for about 15 minutes at 350 degrees before mixing in the pumpkin. i also added sliced almonds…i read somewhere to not add them for the entire baking process because they can burn, but i forgot that and it turned out just fine. i baked the mixture for 30 minutes or so and it turned out nice and crunchy. the spiced flavor is delish but not overwhelming…will definitely make again. love the site maria…more commenters should try the recipes and post their successes – i would love to hear other variations and recommendations! Rose-so glad you liked the granola. Great adaptations! homemade granola is the best! this flavor combo sounds great 🙂 it would be so tasty with my yogurt for breakfast! Okay, made this wonderful granola last Friday. Realized, when the granola was cooling, I was going to have to make more as it certainly wasn’t going to last long in our house. Sure enough, I ended up making a double batch in addition to the single batch and by Monday I barely had enough to eat with milk for breakfast. Thanks for the recipe, my family loves it and we are looking forward to trying your cinnamon honey granola recipe too. This would be super tasty in a parfait with yogurt. making this for sure! I tried this last night and meh…it was so so. Not a total fail,but not as yummy as I am used to. Not sure what went wrong. I may tweek and try again. Sorry it wasn’t a favorite for you. It is for us! I love love LOVE the sound of this recipe and can’t wait to try! I still have never tried homemade granola (I’m spoiled and my mom makes me her famous recipe all the time) but this has convinced me that I must try! I would love to enjoy this granola over yogurt. It looks so yummy! This looks amazing! Will definitely be making it soon. Thanks for sharing your delicious recipes! This looks delicious! Do you think I could substitute Agave nectar for the Maple syrup, or would it mess up the consistency? Yes, you can use agave, but use a little less since it is sweeter. Enjoy! I made this granola this weekend and it was SOOO good! I substituted honey for the maple syrup, and I was out of applesauce so I used canola oil. Such a great recipe! Thanks a million!!! Pingback: a big warm hug of healthy. « does that make sense? Great recipe! Used some left over pumpkin puree from another recipe and it all worked out great. Added fresh cranberries instead of dried. Check out my review on thedo-tique.blogspot.com! This sounds awesome. I have never had or made homemade granola but must try this. One question what is pepitas? Would you have any suggestions on how you could also make this into granola bars? We love pumpkin everything! if i don’t have apple sauce, can i add more pumpkin puree or is the apple sauce a necessity? I haven’t tried it without the applesauce, but I am sure more pumpkin would be fine. Let me know if you try it! You can make up the difference with extra pumpkin and extra maple syrup. It will be great! ..cut the recipe in half and substituted maple for agave since i ran out and since i had no pumpkin spice mix i simply replaced that with garam masala mix (trust me it works! )…also substituted pepitas for pecans and almonds…final results? YUM! Definitely a keeper, a wonderful pairing of flavours, although next time i will leave the granola longer in the oven as it didn’t turn out crispy/crunchy at all but i did get the big clumps so it wasn’t a major disappointment 🙂 cheers for the recipe! This is such a clever idea–thanks for the inspiration. I included it in my weekend links round up. This is a wonderful recipe! I had to highlight it on my pumpkin blog. It’s so hard to find lowfat granola recipes too. Thank you, thank you, thank you! This was fantastic – my husband and kids can’t stop eating it – what a great recipe – I just had some over the yogurt I made this weekend and it is sinfully delish! I’ve made this twice now, both times just using all pumpkin or another squash instead of applesauce. I find that it takes a little more moisture to get it nice and clumpy to start, but maybe that’s because the squash I used is drier than pumpkin puree? I also cooked it a little more each time to get it nice and crunchy. Overall, amazing! My husband and I have a hard time not eating too much of it before it even goes in the oven! I will have to try it with squash. Glad you like it! I just made this granola tonight, and I’m waiting for it to cool. I love that it doesn’t have oil in it either, but I want to tweak it and reduce the sugar. Thanks for the recipe! i love making granola too! This recipe was fantastic. I followed the directions exactly, but baked it a little longer so that it was really really crunchy. Phenomenal….absolutely the perfect yogurt topping! THANK YOU! Glad you enjoyed the granola! I’ve been trying to make granola for what feels like ages but could never seem to find quite the right recipe, thanks so much, this one was exactly what i was looking for. Oh my goodness! This is delicious! I was able to make it using gluten free oats and it’s perfect. Thank you for sharing it. You are welcome. The pumpkin granola recipe is my favorite! Hi Maria! Thanks so much for linking up this granola today. It looks awesome! This granola looks amazing! I am obsessed with anything seasonal, especially pumpkin! How long will this last in an airtight container? I had the granola in an air tight container for about 2 weeks. It didn’t last any longer than that:) It might keep even longer though! Enjoy! Love how there’s no oil in this recipe – and I love clumps in my granola! This looks perfect for fall! I bet it would be perfect with some yogurt or ice cream! Wow, this looks great… I’ve just gotten into making my own granola and it’s about to run out. I guess I’ll just replace it with this! I made this over the weekend and fell instantly in love. It’s insanely good! Will probably need to make another batch before the week is over. Glad you liked the pumpkin granola. It is my favorite! What a creative use of pumpking! 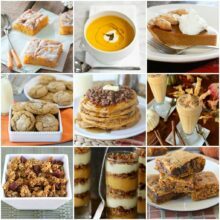 Pingback: Fall Recipe Roundup - Pumpkin Please! I just made this and it tastes great! Mine isn’t to clumpy but its wonderful and my house smells amazing! thanks for posting this recipe. It will go great on my oatmeal and yogurt! Glad you enjoyed the granola. It is a perfect topping for oatmeal and yogurt! I just made this tonight using my gluten free oats, came out great, thanks! Glad the gluten free version turned out! I just made the granola last night (finally got around to it). It is amazing Maria! This will be a recipe that I will be making over and over. I am a pumpkin nut this time of year. I see what you mean by “it might make it more than two weeks”…I highly doubt that this granola will last that long! I love this stuff so much. I added candy corn, because tis the season. Plus there is something about pumpkin and candy corn that just screams fall. Keep up the good work, I am obsessed with this blog! This is perfect for this season! I’ve been looking at granola recipes and I think this has won 🙂 I can’t wait to make it! I made this last night and had it for breakfast this morning. I love pumpkin but there seems to be too much of something. I don’t know if it is the nutmeg but I think one of the spices is too strong. You can always reduce the spices to your liking! Thanks. 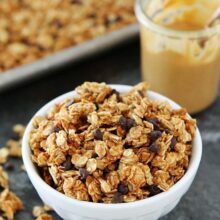 I found this after searching for a Pumpkin Granola recipe, because I wanted a good granola with more fiber, less sugar and fat. I know that pumpkin and apples are good sources of fiber, so I was delighted to find this. To bump up the fiber even more, I added to this recipe 1/2 cup psyllium husk, 1/4 cup flax meal, 1/4 cup sliced almonds and 1 oz chopped dried apple. I also substituted 1/4 cup honey for the 3/4 cup brown sugar, and it turned out great. I left out the cranberries, because I usually add fresh fruit later. 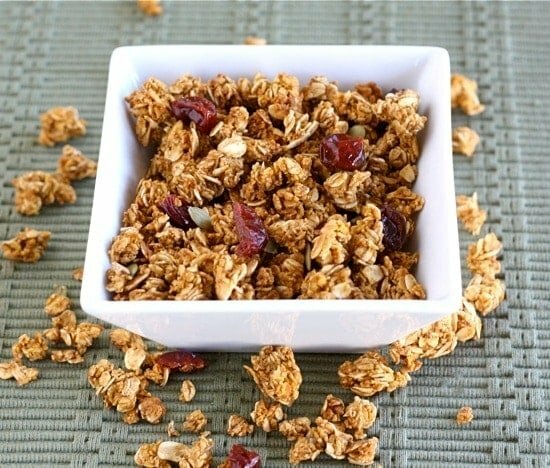 Accordingly, 1/3 cup of this granola comes in at about 120 calories and 5 grams fiber. I serve it with sauteed apple slices and nonfat yogurt, which tastes more like dessert than breakfast! Pingback: The Family Foodie » Crazy . . .
I’m so happy to be able to make something healthy and yummy for the munchkins! They’ll all be here for Thanksgiving this year! I’ve kept it in an air-tight container for about two weeks. It never lasts longer than that for me:) I love it! This is some of the best granola I’ve ever made! 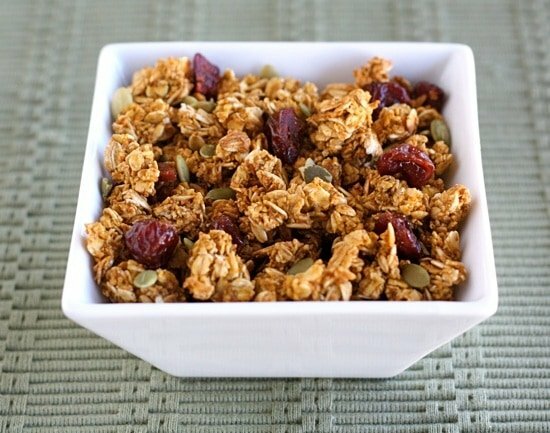 LOVE this granola recipe! I’ve made it twice and it’s a huge hit. I never have pepitas so I’ve always left that out, but I’ll definitely try it with those at some point. I used slivered almonds (because I had them) and that was a great addition. Thank you very much! Glad you liked the granola. I will have to try almonds next time. This stuff is fabulous! I just made it. Added sliced almonds and chia seeds to mine. 🙂 Thanks for the recipe! Glad you liked the granola! Looks amazing! Is there an necessity for the brown sugar or can I omit it for a slightly less sweet version? This sounds so good. Saving the page and recipe to make this Fall! Made this a few weeks ago, and making it again today because it was so good. We eat it with nonfat Greek yogurt, and my daughter enjoys snacking on it by itself. Thanks for the great recipe. I made this granola last night and, although very tasty, I felt like it didnt taste ‘pumpkiny’ enough… any suggestions out there? Its yummy and I I love clumpy granola so I appreciated how it clumped together as well as the lack of fat but I just was expecting a more umphy pumpkin flavor and was disappointed to not get it. I seriously love this granola. Seriously. However, I’d like to eliminate the refined sugar. Has anyone tried making it without the brown sugar? It seems like it would be sweet enough with just the maple syrup. Thanks for the recipe! It’s for sure a keeper! I made this, and it’s awesome. I had it in a bowl of almond milk 1 morning, and on top of blueberry yogurt the next. Both ways it’s delicious! Making my 3rd batch today – My cousin who doesn’t like granola finished the last batch. Yay! Glad the granola is a hit! Keri- I didn’t have maple syrup when I made the first two batches and just increased the applesauce to equal the measurement of the maple syrup…it was sweet enough for me. Yummy! Mine is in the oven now. I made some changes by leaving our the sugar and adding some honey. I also added bran, flax and coconut to my dry ingredients. I can’t wait to try it!!! Thank you for this recipe! I love it and make it regularly. Pingback: The Holt Clan » Blog Archive » snow day! Pingback: Pumpkin Spice Granola- and Giveaway Winner Announced! Pingback: a flop… because I’m not perfect! How many servings does this make? How much is one serving of this granola? I just made this again for the 4th time. I just love it. I combined the coconut, cranberry, etc with the pumpkin granola recipe together! At the end I added dried blueberries, cherries and cranberries at the fruit. MMMMMM. I really like using the applesauce and pureed pumpkin in it! So glad you like the granola! I never buy pumpkin pie spice. I was just wondering what you would suggest using instead of that 1 tsp of pumpkin pie spice. Do you create your own pumpkin pie spice? If so, what combination of spices do you use? I am hoping to make this recipe tomorrow. It looks so great. I just finished making your pumpkin granola bars and they are so good. I’ve always wanted to try making granola, and finally got around to it with this recipe. It is fantastic! Very tasty, healthy, and easy to make. I will be making this recipe again! I’m also excited to try other granola recipes now, too. I was very excited to try this out because I am a HUGE fan of pumpkin. It took longer than the time the recipe called for, so I ended up splitting it onto two cookie sheets to speed it up. It was a bit bland for me without any nuts or fruit. I ended up adding craisins, yogurt covered raisins, and sliced almonds and it made it much better. Definitely looking forward to adding this to my Greek yogurt! How many cups does this recipe yield? It sounds incredible!!! Second time making this. It’s SO good. Could you use honey instead of maple syrup and do you have the nutritional info on this? Loos so yummy!! This will be my snack when watching a movie or my favorite shows. Hey, this looks awesome! I was just woning if you would be able to omit the brown sugar? It will be less sweet, but it will work! Can I use steel cut oats in this recipe? I made my granola tonight. The aroma is just amazing. I did bake my cranberries and raisins in the oven. I will see how they taste once it cools. I did not put nuts. I put dates, pepitas, sunflower seeds, old-fashioned rolled oats. I used agave, coconut oiil , vanilla extract. Excited ! This is the first time I have used the agave. Hi, I made this once and will now need to double the recipe. What else could I add besides cranberries and pepitas? Could I add chia? You can double all of the ingredients. If you want to add chia, you can!